Applying for a job isn't easy. Lurking beneath the surface of any job application process are a number of hidden traps; icebergs that could send your hopes for a dream job spiralling to the ocean floor. "There is no danger that Titanic will sink. The boat is unsinkable and nothing but inconvenience will be suffered by the passengers." That's why Michael Heath, a respected interviewing skills consultant and assessment centre designer, has written this book. 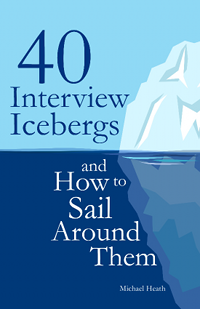 In it, you will discover the icebergs that could easily sink your application and learn the skills and insider tips to successfully sail around them. Michael has melted the application process into eight easy-to-navigate 'iceberg zones', dealing with stages of the process such as CVs and application letters, interview style, dealing with questions, presentations, assessment centres and what to do after the interview. But don't think that this book only represents the experience of one expert. Michael has asked recruitment and HR professionals around the world the simple question, "What are the most common interview errors that stop you from hiring someone?" Distilled into this easy-to-read book, you'll find their wisdom and Michael's insights; a combination which will deliver you safely into port - and the job you've always wanted and deserved.